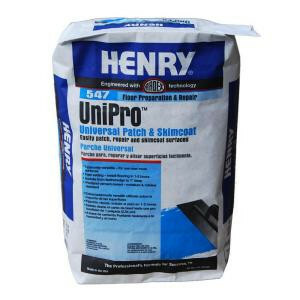 Easily patch, repair and skimcoat indoor surfaces with the Henry 547 UniPro 25 lb. Universal Patch and Skimcoat. This underlayment sets in 2 hours and can be used on concrete, wood and metal flooring as a feather-edge, deep fill or embossing leveler. For patching and repairing indoor surfaces prior to flooring installation. Approximately covers 40 sq. ft.